【Colorful large sized board】The Magnetic Drawing Board displays 4 vivid colors, making your child\'s drawings colorful. 【Easy slide eraser】Gently slide the magnetic brush at the bottom and all drawings will be removed. It\'s so easy that your kid can do it on its own and use imagination & creativity to create endless drawings and paint freely! 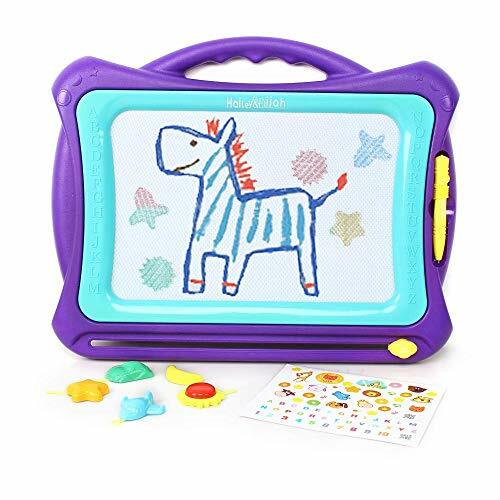 【Health and safety】The magna doodle frame is made from high quality nontoxic ABS plastic materials, it is smell-free and more friendly to kids. It is durable and highly break resistant. The round edge design protects your kid\'s little hands. 【Children development】Draw, write and play games on the magnetic doodle board using the stylus to encourage your child\'s creativity and help them to learn how to express themselves visually. The Magnetic Drawing Board contributes to developing your child\'s imagination and hands-on ability. 【Cute stamps】The colorful stamps fully arouse your child\'s attention and interest. It can also develop your child\'s awareness of different shapes. With the help of the stamps, your child can have more drawing options. The stamps inlay the back of the drawing board to prevent loss. Can't wait for the grandsons to come play with it!